One of my book-related goals this year has been to read about inspiring women and report back on it once per quarter. Well, since this is April, it is high time for the first quarter report! 5 stars: So much to take away from this one! Each of the eleven keys mentioned in the title gets its own chapter, including "Uses of Time," "The Difficult Art of Maturity," "How to Get the Best Out of People," and "How Everyone Can Take Part in Politics." The very first paragraph of the first chapter sums up her underlying philosophy of life: "What I have done is to live every experience to the utmost." This first chapter is titled "Learning to Learn" and it is all about this deeply present way of experiencing life. If I go by how many passages I highlighted, this books has been one of my favorites! She has so many practical suggestions and sound ideas. She is a strong believer in the power of self-discipline, and in being open to new experiences or viewpoints. I really appreciated her emphasis on home and family being the most important thing. Even with all of her public roles and responsibilities, she organized her time so that she was able to be there for her children and husband when they needed her. That's what I'm hoping for with my flower farm! I want to draw my children into it with me. Teach them how to grow beautiful plants and even how to make beautiful arrangements from the flowers that we grow. I'm hoping we can learn the business side of it together: marketing, sales, planning, and so on. I'll let you know how it goes! Another one I highlighted from the chapter "Learning to Be Useful:"
As I was looking back through the book for this review, I found even more passages to highlight. 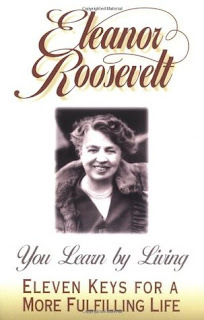 This is one I definitely want to re-read from time to time, in hopes of absorbing more of her wisdom! 4 stars: A down-to-earth portrait of a unique lady. 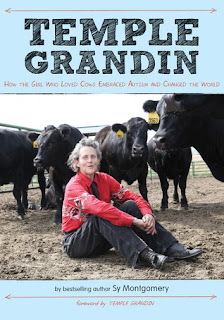 Temple Grandin was always different--from her siblings; from her peers. Though she always had lots of friends in elementary school, she never quite fit in. Back then autism was still a new diagnosis, so while her parents knew she had some trouble they didn't know quite what to do to help her. Her later schooling didn't go so well, but she rallied and eventually went on to college. She had a brilliant mind that processed everything in pictures and yet, she couldn't understand how to hold a "normal" conversation or read social cues. She often felt frustrated and misunderstood. One place that she always felt calm and at home, though, was in the cow pen. She understood cows--what made them frightened or angry, and what made them feel calm and happy. As she got older, she used her skill at inventing machines and drawing up plans to began to make a difference for these big animals she loved. She visited feedlots and slaughterhouses, big and small farms. Many times, once the men in charge let her in, she could see at once what would be causing the problem. They often would lead her around to the most awful and disgusting parts of the operation, hoping to make her go away. It didn't work. It made her more determined to do what she could to fix the problem. So she invented cattle chutes that were circular, with high walls so the cows couldn't see things that would make them antsy. She invented systems for slaughterhouses that would allow the cows to not be afraid or treated badly before they were killed. My favorite was her invention for the dip vat. Cows were getting scabies, caused by mites burrowing under their skin and laying eggs. The only treatment available required the cow to be completely submerged in a vat of the medicine mixed with water. Farmers were having terrible trouble trying to give this medicine to their cows. The cows were so afraid that they were drowning in the vat. They turned to Temple Grandin in desperation. Temple took the task in hand and designed a large tank, with a gently sloping, nonslip ramp down into the medicated water. At the very end of the ramp, it steepened dramatically, which caused the cows to dip under the water. Then they would pop back up, swim to the other side, and walk up another ramp to get back out again. No fear. No more dead or injured cows. No more scabies. Triple win! She continues to work and advocate for the humane treatment of animals, particularly farm animals. Sy Montgomery once again has done a top-notch job bringing her subject to life. This book is geared toward a middle grade audience. It is full of photographs, many of them full-page. There are pages inserted here and there talking more in-depth about autism, giving statistics about farming, and other relevant information. My almost-10 year old picked this one up on his own and read it, when I had it laying out. I was inwardly delighted and outwardly cool and casual. I want to read it to his siblings at some point, as well. I am inspired by the way Grandin has made a place for herself in the world, doing what she loves and cares about, despite what many would regard as a disability. I especially appreciate the message of this book--that it's okay to be different from everyone else. You have something to contribute! Now I want to learn more about her. She has written books and there is a movie about her life, too. A worthy addition to the list! 3.5 stars: Why have I never heard of her before now? Hannah More loved to write from the time she was a little girl. She asked for paper for any gift, because her parents weren't very well-off, and paper was expensive. As she grew up, she and her older sisters opened up and ran a very successful school for young ladies. Hannah was first a student at the school, then later on became one of the instructors. Her writing earned her much acclaim throughout her life and great influence, as well. One of the things she was most passionate about was abolition. At the time, Great Britain depended heavily on the slave trade. More was a contemporary of William Wilberforce, portrayed in the excellent movie "Amazing Grace." While Wilberforce used his influence in Parliament to push for stopping the slave trade, More used her pen. Her work was widely read by both high born and commoners. When she realized that salacious tracts, nicknamed "Penny Dreadfuls," were some of the only literature available for poor and lower-class families, she undertook to write some of her own. They were written in story form, each with a strong moral and self-improvement tips sprinkled throughout. While today we may think it a bit presumptuous or heavy-handed, they were immensely popular at the time and sold out as fast as they could be printed. More's passion in life was advocating for those who did not have a voice of their own and she was remarkably successful at it. 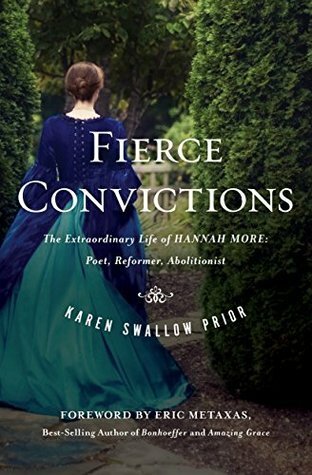 Hannah More was very popular with all levels of society in her own time. It's a shame that she has been so forgotten in our time. (Or has she? Did you know who she was?) She was a woman not afraid to express her opinion, and use her way with words to influence others for the greater good. I'm glad I got to know some about her. Interestingly enough, More never married. She was a courted by a man for several years who kept backing out on marriage at the last minute, until she final had enough and severed ties. Well said, Ms. More, well said. I thought Prior did a good job portraying Hannah without idolizing her. She didn't gloss over or justify More's faults, but instead showed us a real portrait of a compassionate woman, moved to action on behalf of others. Okay, who should I read about next? If you have a real-life heroine, let's hear about her!